Managing your Timber Resource: Which Trees to cut, which Trees to leave? Forest Soil - How does it function? 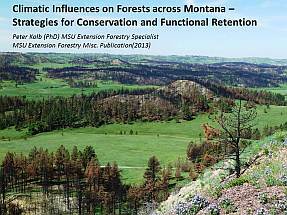 Climatic Influences on Forests across Montana – Strategies for Conservation and Functional Retention. 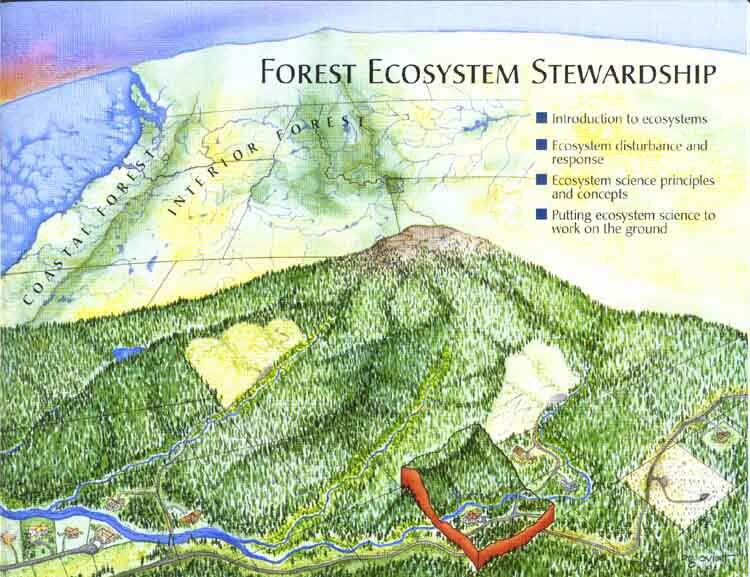 This book illustrates how various management alternatives have affected forest ecosystems in the Northwest. It explains ecosystem management as a way to ensure clean water, plant and wildlife biodiversity, and sustainability of the forest resource. Includes examples of how ecosystems in the Northwest have responded to wildfire, volcano eruption, and other natural and man-made disturbances. 49 pages. (1997) - MSU Extension Service Publications - EB0141. 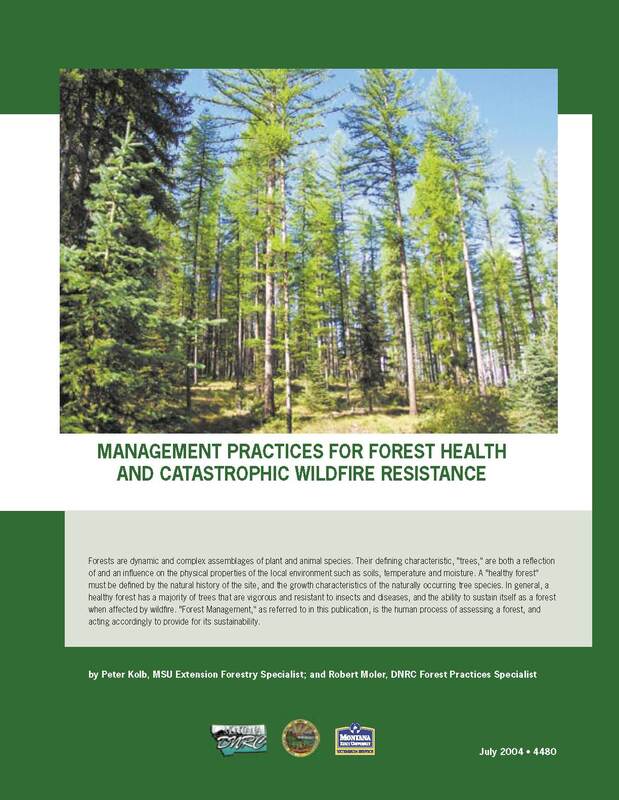 Management Practices For Forest Health And Catastrophic Wildfire Resistance. This full-color publication includes sections on natural changes within a forest, tree species and their different needs for disturbance, tree selection and harvesting strategies, and the "big picture" goals of forest management. 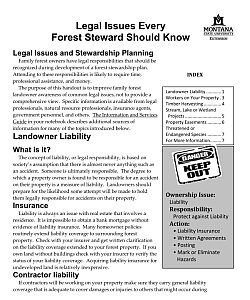 The publication also includes a resource directory. (2004) - MSU Extension Service Publications - EB4480. Four-color pamphlet discusses forests found along streams, lakes and reservoirs. (1994) - MSU Extension Service Publications - EB0118. 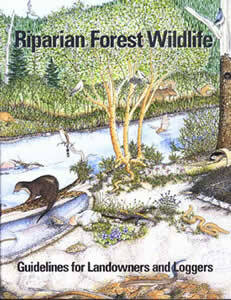 This colorful publication illustrates reasons for voluntary wildlife habitat management guidelines in riparian forest areas. It describes unique characteristics of forests along streams, rivers and lakes - and the countless wildlife species that need them to survive. 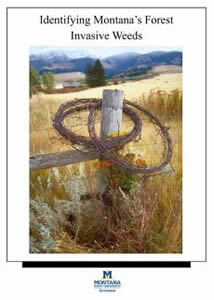 Includes discussion and illustrations of plants, birds, fish, reptiles and mammals found in Montana's riparian forests. 28 pages. (1997) - EB0146. 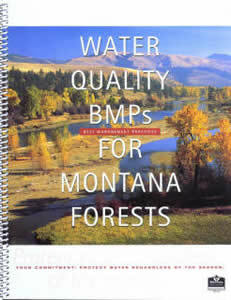 Water Quality BMPs (Best Management Practices) for Montana Forests. 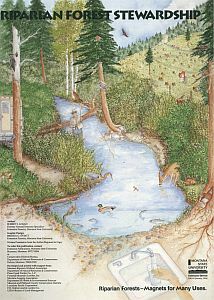 This colorful, copiously illustrated spiral-bound book details best management practices for watersheds, riparian and wetland areas, roads, stream crossings, and more; it discusses sediment, streamsides, soil, timber harvesting, reforestation, special winter concerns, and the cleanup of hazardous substances. 58 pages; illustrations throughout. (2001) - EB0158. Growing Trees on Montana's Prairie. 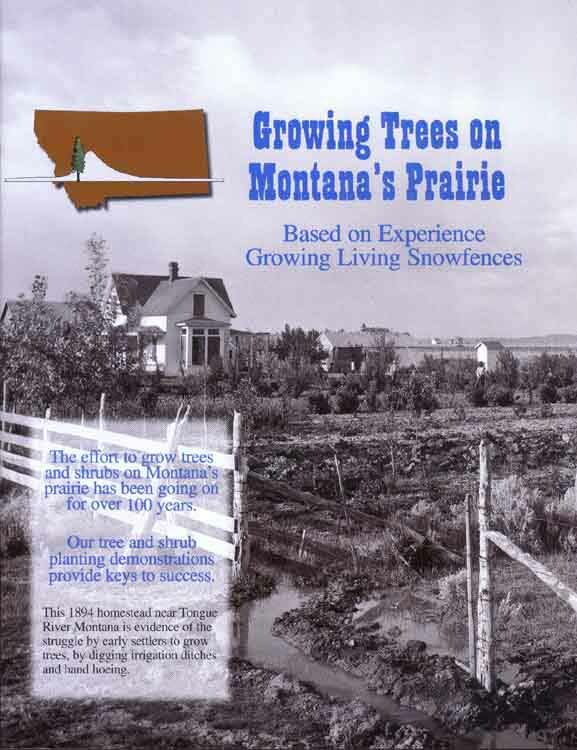 This 25-page booklet uses color photographs and detailed descriptions to show a variety of ways for growing trees on Montana's Prairie. It covers topics from Site Preparation Tips, Planting Tips, Tree Protection, to Growth Enhancement Devices and Mechanical Cultivation Weed Control. (2000) - EB0157. Call before you cut - A Resource Guide to Forest Management. By Michael Justus, Montana Tree Farm Inspector, DNRC and Dr. Peter Kolb, MSU Extension Forestry Specialist. Whether it is your back yard or the back forty, assistance is available to help you manage and protect your forest resource. 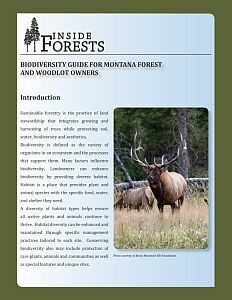 Biodiversity Guide for Montana Forest and Woodlot Owners. 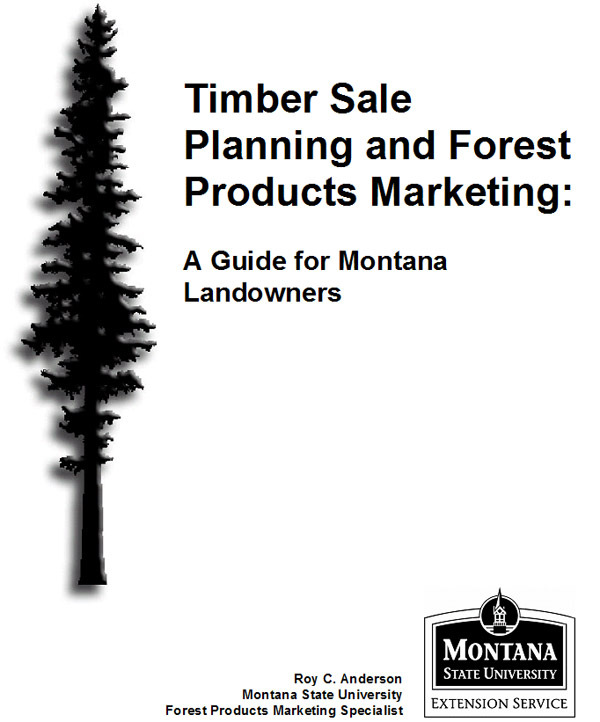 Timber Sale Planning and Forest Products Marketing. 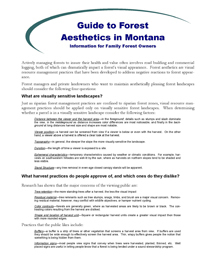 Guide to Forest Aesthetics in Montana. Trees and Shrubs of Montana Forests. 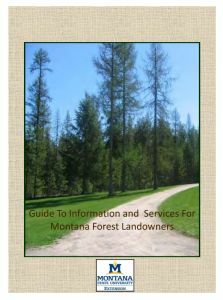 This publication is aimed at making it easy to identify trees and shrubs growing naturally within Montana. A few introduced species are also included. By learning how to identify trees and shrubs, you will improve your knowledge about Montana and about the growing things near streambeds, mountain slopes and practically everywhere else that plants grow. Two names are given for each tree and shrub. One is the common name and the other the scientific or Latin name. Black and white photos included, spiral bound. 74 pages. Available at MSU Extension Service Publications - EB0219. Important Plants that every Forest Steward should know. This guide will help you identify 36 important plants found in Montana forests. Information for each plan includes a description, similar looking plants it can be confused with, where it is found, and how it is used. 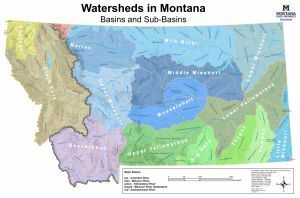 Identifying Montana's Forest Invasive Weeds. 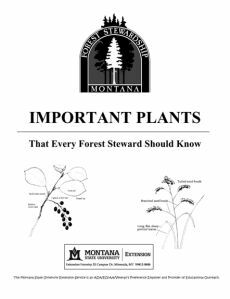 This guide helps to identify 22 Montana noxious plants in forested areas. Additionally, plant management guidelines are listed at the bottom of each page that identifies a plant.